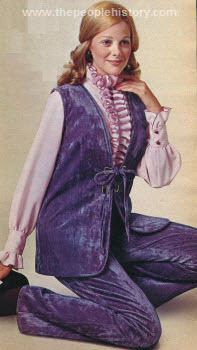 Fashion Clothing From the year 1972 including prices, descriptions and pictures for Ladies and Gentlemens hats, jewelry, scarves etc. Description Polyester knit jacket checks into the fashion picture. An easy-going style to top off your favorite slacks for that casual put-together look. Flap pockets; one on chest and two below. Button front. Description Choir boy dress has soft bow trim under the white collar. Side seam pocket. Patent-look belt to wear or not. Back zip, finished hem. Printed plaid cotton broadcloth. Description It's the favorite look of corduroy in the favorite fabric--denim. Done in the happy harlequin style--great from any point of view. Four patch pockets, stylish flare bottoms, wide loops. Polyester-cotton. Color combinations include navy/burgundy or tan/brown. Description Take a look at this crushed velvet pantset--so luxurious, so touchable, so plush--and not it's completely care-free! Hip length vest laces with gold-tone metal eyelets. Pants pull-on with elastic waist and finish-off with gentle flares. Colors come in purple or red. Description A touch of the orient is just right on this dreamy shirtdress. 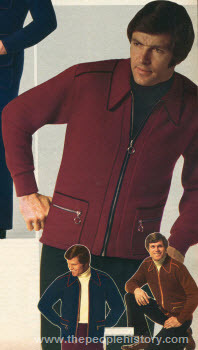 Gold ribbon trims the zip-front, cuffs. Skirt has cluster pleats and a two inch hem. Dacron polyester-cotton broadcloth. Colors come in red or blue. Description Exotic print in a colorful abstract floral design (purple predominating) fashions this silhouette with romantic long sleeves and gently shirred waist. Purple leather-look belt. Stand-up collar. Back zipper. About a one inch hem. Description The long shift's so dramatic with its deep off-center front slit! It has a tall stand-up collar, cut-away shoulders and long nylon back zipper. Choose from turquoise or orange. Description The Glamour coat brings out the femme fatale in you and the envy in others. A shadowy velvet in crush-textured rayon on cotton shimmers against the fluffy lamb trim. Dyed-to-match fur goes full circle around cuffs and hem. Note the new petal collar. Angled slit pockets under flaps. Lined in acetate. 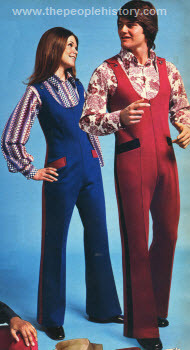 Description Orlon knit jumpsuit for him 'n her. Step in, zip up and go in this great new tank top jumpsuit. Smooth, to-the-body styling that keeps its shape throughout the action. DuPont Orlon acrylic bonded to nylon feels good inside and out. Contrast color side panels and slash pocket trim; swinging flare bottoms; center stitched leg crease; adjustable shoulder straps and a full length zipper for fast change dressing. Description The hooded Czarina pantcoat has a shimmering face of pony-look rayon pile with polynosic back laminated to shape-holding foam. Deep black pile of Orlon acrylic on polyester outlines hood, hem, front and cuffs. Acetate lining, warmly interlined with reused wool, other fibers. Galosh clasp closing. Colors come in silver or rust. Description Jacquard pattern, all berry and gray! Has a contoured, elasticized waist. Description The nautical look accomplished here in a pantset with a zip-front tunic that has side slits. Detachable tie, bib insert snaps at side. 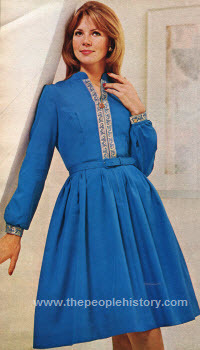 Contrast trim at collar, sleeves. Comfortable elastic waist pants. Choose from red with navy trim or navy with red trim. Description One-piece dress with jumper and blouse look. Button front, plastic tie belt. Denim-look jumper-effect of cotton broadcloth. Sleeves and bodice insert are of polyester-cotton. Back zip. Two-inch hem. Colors come in denim plum and denim blue each with a harmonizing print. Description Patches and pieces of color get this four patch pocket jean all-together. Belt loops; zip fly front. Description Feeling quilty! Maybe it's because you look great in a handsome denim suit with the fashion features of a more expensive style. Jacket is lined in shearling-like acrylic on cotton back. Metal snaps close front and cuffs. Contrast quilted long pointed collar and pockets with snap flaps. 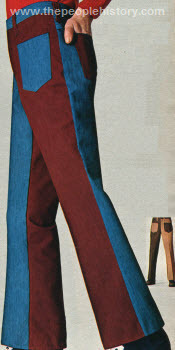 Flares have contrast quilting below "V"-knee and patch pockets. You'll have the comfort of rugged denim and the surprise of popular quilting. Comes in blue or burgundy. Description Whirl away wearing this sleeveless dress in vibrating solid color. Stand-up neck, back zip. Stay-in fan-pleated skirt has finished hem. Rhinestone buckle sparkles on the self-belt. Crepe stitch polyester double knit. Colors come in purple, bright red, or black. Description This splendiforous Djellaba is excitingly vivacious and new in this vibrant multi-tone print. Beautiful bodice definition is achieved by adjusting the elastic inner belt. Neckline drops to a "V" at front; back zipper. Extravagant butterfly sleeves; soft, drapey self-bow. 100% acetate Honan-type crepe. Description Vertical stripe pattern like this looks best in a knit. Two horizontal flap pockets--welt breast pocket. Suit is shaped for comfortable fit. Straight leg pants with wide belt loops, wide waistband. Cuffless (hemmed) bottoms. Comes in blue or brown. Description Love it laced for the free and open look and all the more for the screen print front. Pants take a gentle flare, comfortable elasticized waist. Top is polyester and the pants are Acrilan acrylic bonded to nylon tricot. Description This zip-front sweater of 100% DuPont Orlon acrylic has style you can't miss. The three zippers do it. A metal ring pulls the front zipper from bottom to four inch long point collar. Each side pocket is topped by another metal ring zipper. Contrast color trim flanks the front zipper, runs all around the collar and across top of each pocket. Colors include wine, blue and brown.